In this close examination of the social and political thought of Marcus Tullius Cicero (106-43 B.C. 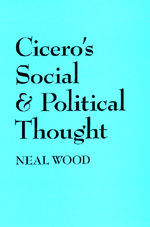 ), Neal Wood focuses on Cicero's conceptions of state and government, showing that he is the father of constitutionalism, the archetype of the politically conservative mind, and the first to reflect extensively on politics as an activity. Neal Wood is Professor of Political Science at York University. His most recent books are The Politics of Locke's Philosophy (California, 1983) and John Locke and Agrarian Capitalism (California, 1984).